Included is a flattering khaki coloured dress styled with frilled detailing to the hemline and a low neckline. 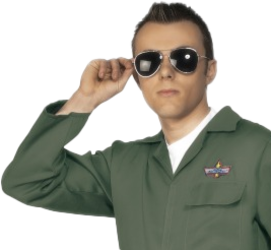 Completing the ladies' Top Gun fancy dress costume is a leather look bomber jacket styled with realistic looking pilot's patches and rib knit detailing to the cuffs and hemline. 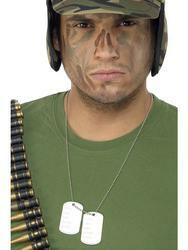 A great costume for wearing to a film, military, uniform or 1980s themed fancy dress party. Leather look bomber jacket with attached pilot's badges.